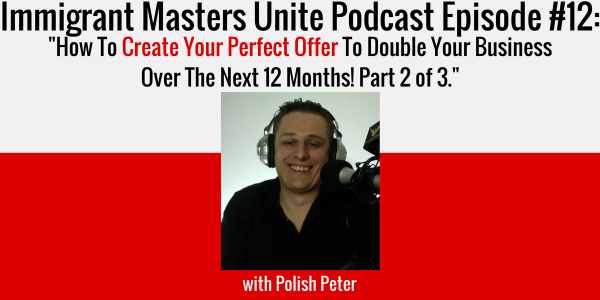 IMU 012: How To Create Your Perfect Offer To Double Your Business Over The Next 12 Months! Part 2 of 3. | Immigrant Masters Unite Podcast: Transform Your Business, Life and The World Around You! This is Polish Peter and welcome to episode 12 of Immigrant Masters Unite. This episode is part of a series of training podcasts focused around marketing and building your business. The goal of this mini series is to help you double your business over the next year. If you haven’t seen the podcast show notes from episode 11, you should, as this is a crucial step to developing a winning campaign. Last week, in episode 11, I spoke about creating a perfect client and the Client Profile for it so you can attract the best clients that will convert for your business. Today, we’re going to focus on creating a profitable and a winning offer for that perfect client. That’s pretty obvious right? It’s not rocket science but many entrepreneurs, completely miss the mark and waste time, money and resources trying to sell something your market doesn’t want. The top 8 criteria you have to use when creating your next product or service. Miss this one crucial step and the conversion rate on your product or service will take a deep dive and your revenue will suffer. The must have shift you have to make in your business in today’s marketplace and why giving your stuff away for cheap and even free will make you more money that you ever did before. So, head over to the Itunes or Stitcher right now and listen to the podcast. Once you are listen to the episode, remember to review and rate it on Itunes and come back to mastersunite.com to download a free copy of the show notes. 1. It has to solve a very specific problem. 2. It has to speak to their end result, to what they want to get/achieve. 3. It has to satisfy immediate gratification. 4. It has to have a high perceived value. 5. It has to have a high real value. 6. It has to shift the relationship between you and the prospect. 7. It has to be consumed fairly quickly, in that prospect’s eyes.